Julia Higgins brings a positive and supportive energy to every lesson she teaches! As an instructor in CMA’s Discover Music for Kids program, she emphasizes creativity and individuality to guide children on the first steps of their musical journey. In Julia’s studio, students learn about the fundamentals of music in a way that allows them to express themselves and follow wherever their interests may lead. Lesson plans are developed for the individual needs of each student and Julia works closely with families to create an environment where children can thrive with music. Julia discovered her love of teaching during her undergraduate studies at the University of Cincinnati, College-Conservatory of Music (CCM). 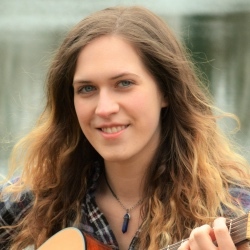 In addition to Discover Music for Kids lessons, Julia also teaches bass, guitar, and ukulele. She enjoys to teach students of all ages and abilities. Julia graduated from CCM with a Bachelor of Music in Jazz Studies. During her tenure Julia played in Jazz Orchestra, Jazz Lab Band, Jazz Combo, Concert Orchestra, and participated in master classes with jazz artists Bill Charlap, Benny Golson, Rufus Reid, among others. While at CCM she began her freelance career, teaching and playing around the greater Cincinnati area. Julia is an in-demand player in a variety of commercial styles, including jazz, bluegrass, Americana, gospel, musical theater, pop and rock.